The feminine form of lace inspires designer Danielle Welmond while the spirit of sensuality underpins Miryana Babic’s brand, i Profumi di Firenze. Distinct muses for two exhibitors with one thing in common at CURVENEWYORK: not a single piece of lingerie was on display at their booths. Instead, gemstones and precious metals sparkled at Danielle Welmond’s space and the luxurious scents of Sicilian oranges and vanilla bean from Madagascar aroused visitors walking by Miryana’s perfume collection. Both entrepreneurs were part of CURVENEWYORK’s Concept Lounge. 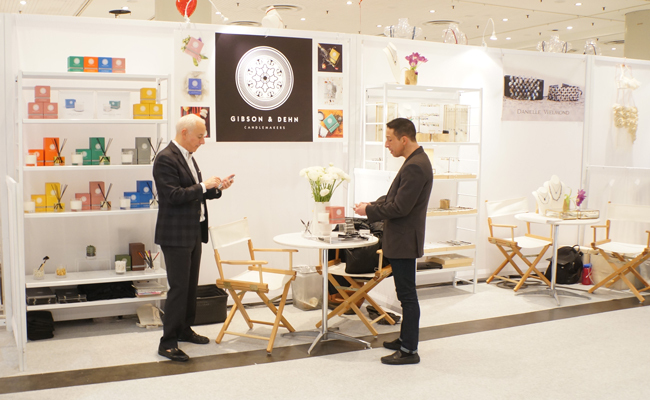 Placed at the center of the show floor, this new area allowed buyers to experience designers like Yes Master, Undress Code, Cadolle, Velvet and complimentary product categories such as jewelry, scented candles, intimate wash and fragrances. 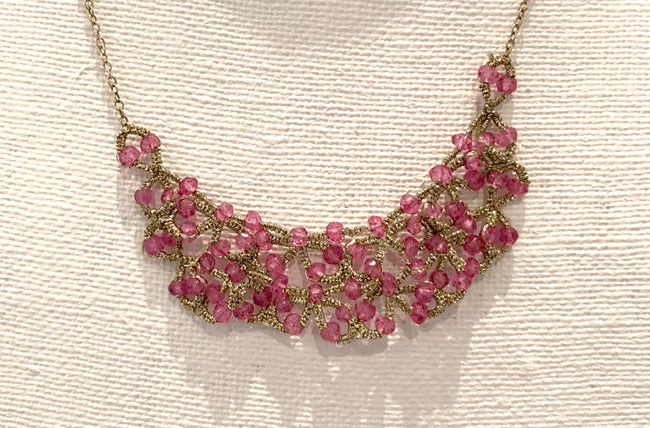 Above: this Danielle Welmond piece features pink tourmaline gemstones woven on gold thread. Lingerie retailers looking to expand into new categories take note: according to Businesswire.com, jewelry is a growing personal accessories category worth $316 billion in 2016. “Personal accessories sales are forecast to enjoy 4 percent compound annual growth rate (CAGR) between 2016 and 2021 to reach US$ 633 billion.“ said the the Berkshire Hathaway company in a 2016 report. For fragrances, Statista.com suggests that the future size of that market (based on 2014 levels) is set to exceed the $5 billion dollar mark in 2019 here in the US. Vibrant, open and inviting were words we heard used to describe the Concept Lounge with good reason — the space showcased bold brands alongside expertly designed Merchandising Displays stocked with a variety of products. It spoke to (and showed off) CURVE’s efforts to start crafting experiences for brands and buyers in New York, Las Vegas and beyond. 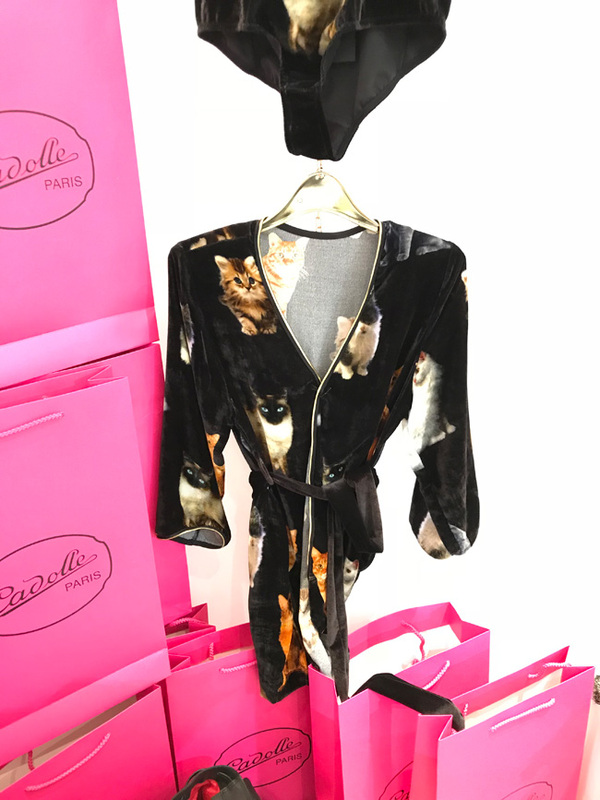 Did we mention we saw kittens on a velvet robe? The Concept Lounge wasn’t the only new addition to CURVE. This February, the show organizers added new seminars, panel discussions, and a “Speed Dating” event. Above: Undress Code’s Izabella Godlewska at the Speed Dating Event. 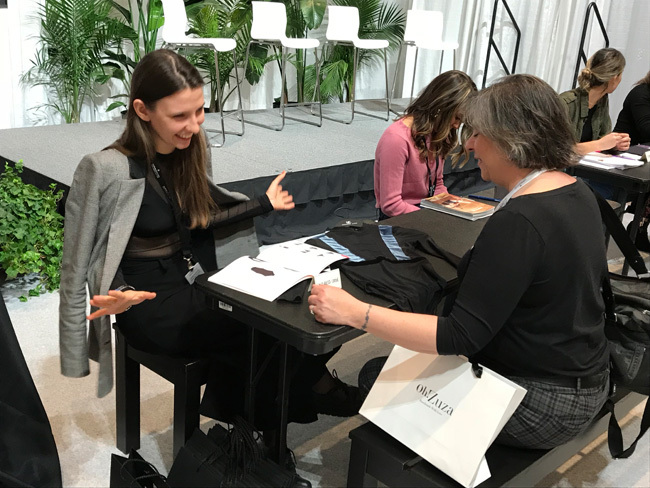 Linea Intima owner, Liliana Mann, kicked off the trade event’s first seminar with “Retailing to Millennials” that attracted a large audience eager to glean insights about millennial consumers. Also on the first day of the show, the “Re-Imagining Retail: How to Stay Competitive” panel focused on how to use technology to connect with existing customers and generate business. Above: Blogger Ami Ceresi of Just Curvy Things at the Adina Reay booth. Photo by Jan Klier. On the morning of February 27, the “Be an Ambassador for Change: The Intimates Evolution” panel spoke to the topic of the changing lingerie industry specifically in the topics of body positivity and using data and social media to define your target consumer. “The introduction of new events in the early morning was a great added value.” said Luxury Box owner, Kat Migiliore. Breast health and post-mastectomy topics were the focus of two educational presentations: “Building Your Business with Anita Breast Care” sponsored by Anita and ”Breast Health with Dr. Regina Hampton, MD, FACS” sponsored by Eveden. Above: the Ajour booth, eim1@ajour.com. Photo by Jan Klier. CURVE’s “Speed Dating” event added a fun twist to the art of networking at a trade show. A selection of brands met with buyers in five minute intervals to introduce and pitch their brand. As we walked around CURVENEWYORK, the whir of a sewing machine caught our ears. We turned to find ourselves mesmerized by artistry in motion at Paul Stuart’s booth. The brand’s seamstress, Florinda Ahumada, showcased her skills and the beautiful fabrics used in the new Paul Stuart collection of luxury robes, kimonos and other loungewear items. Thanks to the brand’s president and CEO, Paulette Garafalo, I also learned quite a bit about Paul Stuart’s entry into womenswear! #CorinLingerie in motion (booth 228) at @curvexpo @alissabourne modeling one of Corin’s latest #Lingerie styles. Above: Corin Lingerie. Distributed in Canada by nbattah@gordonbattahinc.com. USA by info@valenslingerie.com. We could dedicate an entire post to all of the photos and videos from the Lingerie Journal Instagram feed, but don’t have the time. 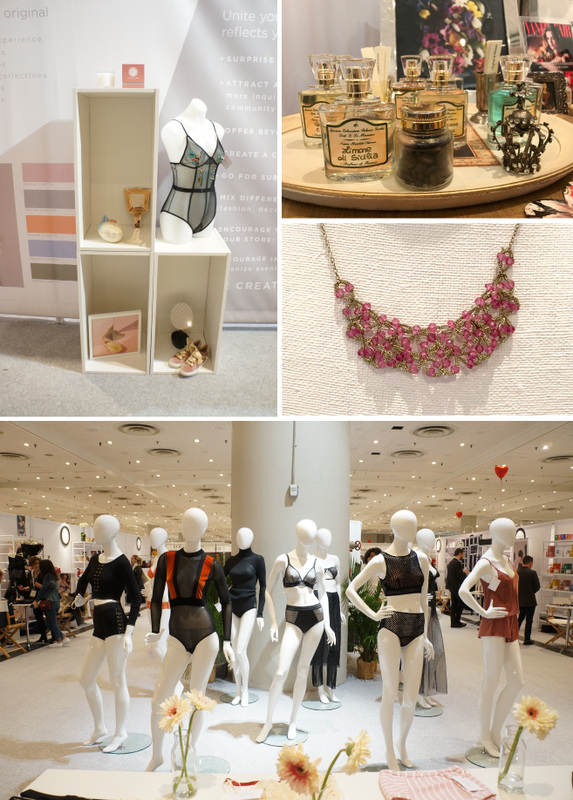 However, in the coming days and weeks, we’re going to explore in detail a few more of the brands we met at CURVENEWYORK in February like Gigi K, Royce Lingerie, Splendid, Colette & Sebastian and many more.